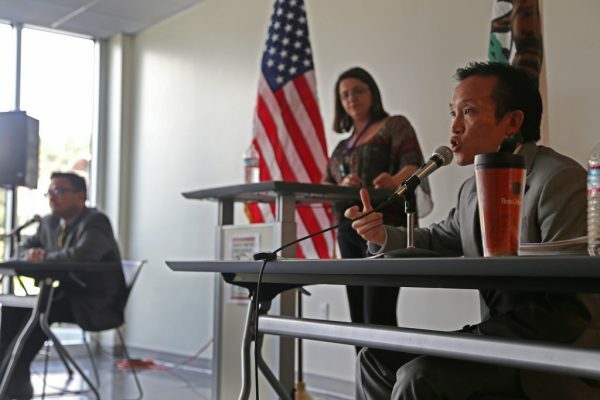 Supervisors David Campos and David Chiu traded jabs in a heated debate last Wednesday in the Leonard Library to rally support in their campaigns for state assembly in the upcoming June elections. The two supervisors attacked each other’s morals, legislative styles and personal journeys to Harvard Law School. Chiu and Campos, both Democrats, while similar in some ways, are not in others, according to Richard DeLeon, a political science professor emeritus at SF State. Chiu, who opened the debate with the recent history of California’s education budget, vowed to revise Prop 13, a 1978 ballot measure that cut property taxes to no more than one percent of the property’s cash value and that he blamed for California public schools’ fall from among the nation’s top to 48th. “My number one priority will be higher education,” Chiu said. Chiu also proposed creating a minimum mandatory funding for higher education, similar to what California does for K-12 schools, rather than the discretionary funding that the University of California, California State University and California Community College systems receive now. Chiu closed his opening statement with his resolve to increase corporate taxes to increase the state’s education budget, which receives 40 percent of the state’s general fund according to the California Department of Education. Campos grinned at Chiu, looked down at his note cards and pulled at the knot of his tie. “In the last four years we’ve created 67,000 jobs, two out of three of these jobs not in technology in case you’re wondering, and at the same time you’ve seen our budget as a city increase by over $1.5 billion,” he said. Campos and Chiu narrated their experiences as the first in their immigrant families to go to college and how affirmative action gave them the opportunity to attend Harvard Law School. “We have to uphold affirmative action and get rid of the presumption that diversity and meritocracy are not mutually exclusive,” said Campos. Naeemah Charles, president of San Francisco State College Democrats was still unsure by the end of the debate.